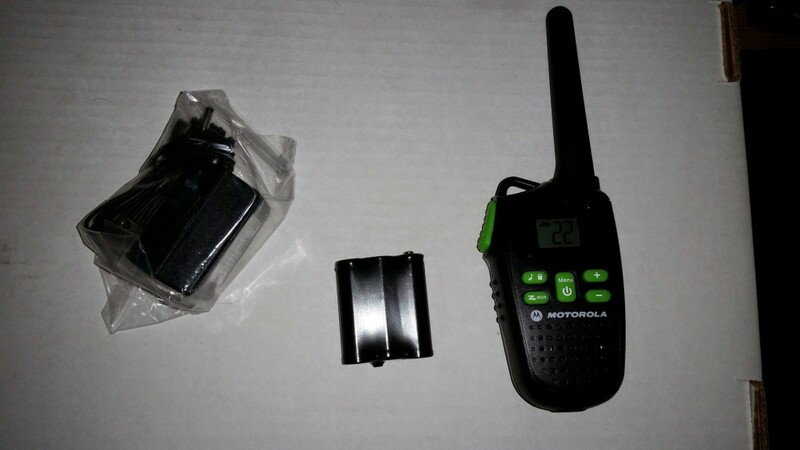 The Motorola Talkabout MD200TPR is a triple pack of radios with an advertised 10 mile range. It also comes in NOAA capable two packs, and normal two packs, in case you aren’t after the three pack that sets this unit apart. While it is not directly advertised as being a radio for children, the impression that one gets when they look at this unit and when you read some reviews and advertising materials provides you with the distinct impression that it is being marketed as a cool gadget for kids or a piece of low-key children’s camping gear. Either way, the unit is definitely capable, but it does have some problems which shouldn’t be overlooked. • Small and easy to hold in the hand. • Comes with 3 radios instead of the industry standard, two. • Relatively easy to use. • Works with NiMH or loose batteries. • Battery case is very frustrating to get open. • No charging cradle, each radio has an individual charging adapter. • Cannot set up straight on a flat surface (convex bottom). This two way does have some problems as well. The antenna is pretty flimsy and, honestly, feels like it could break off if you set the radio down the wrong way. You can only use the NiMH battery that comes with the radio and can use loose batteries. This is a bonus that could be stated a lot of this type of radio, however, so it might not be too big of a deal. The battery case, however, is. It is very difficult to get open. Finally, you should keep in mind that the range on this unit is not much more than 5 miles at best. Even advertised, the range is only 10 miles. If you are on the market for a simple radio with an alright range that is functional but not great, this is probably the radio for you. It is inexpensive enough to be a real option, especially when you consider the fact that it comes with 3 radios and not 2, as most of the packages on the market come with. The case itself is black and is made of what feels like thin plastic. The front has some rubberized green buttons and the speaker for the unit. The front also has the digital readout that displays the information about the radio. The backlight for the display is orange. The readout has black colors, as most displays of this type have. The top of the unit has a small loop to attach a tie to and the antenna, which is made up of rubberized material and is visibly flimsy in its construction. The left hand side of the unit has small ridges which can help you hold a grip and the transmission button. The bottom has the AC adapter port and is rounded in shape, preventing the unit from being set up straight. The right side of the unit has the standard microphone jack. The back of the unit has a belt clip spot (if you choose to put the included belt clip on) and the battery case. The battery case has a clip that is used to get the case itself off and, inside, you either insert the NiMH battery which is included or you can use loose AAA batteries that you might have. The case that the batteries go inside seems very thin and feels as though it would be very prone to breaking if you were not very careful during the time you are putting batteries in. The unit charges through a 5 volt AC adapter that plugs into the very bottom of the unit that will charge the NiMH battery that inserts into the back of the unit. This works through two adapters that come with the unit. One of them is a single connection unit which plugs into only one of the radios. The other is a cable with a Y split that will charge two radios at the exact same time. 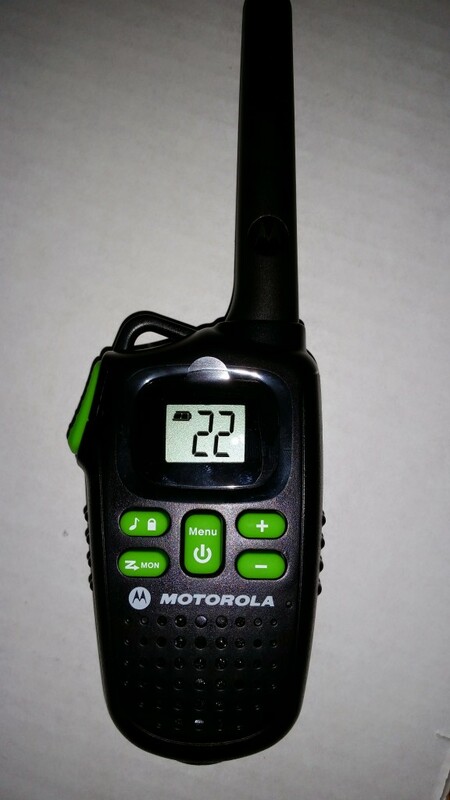 The unit does not, however, come with a traditional charging cable that most packs of two way radios come with, which is unique. The Talkabout MD200TPR is a sleek looking unit, smaller than most, which fits right into the palm of your hand. The case is black. The front of the unit has the buttons and the digital display. On the top of the unit is the antenna and a little loop for attaching a wrist holder. The sides have both an audio jack and the transmission button. The back has the battery case cover and a belt clip insertion area. The front also has the speaker through which communication will take place. The unit itself is not “flat” anywhere, it is rounded all over, including the bottom, and it is very comfortable to hold and is also easy on the eyes. The buttons on the unit are a bright neon green. Again, this fits with the theme of the unit being marketed, at least to a degree, for kids. Kids radios will generally have some bright and standout colors so that the kids can find them should they accidentally lose the radio. This is a great addition to this and, compared with the black casing of the unit itself, only adds something to the aesthetic value. The buttons themselves have white writing on them which stands out from the green, furthering the color patterns that are the hallmark of this unit. The first thing that you are going to experience when you buy this unit is the packaging itself. It is great. If you have ever bought a new smartphone, you have already experienced what it is like. The radios come in a rectangular cardboard box that is sealed by a sticker. Once you get that open, you will find everything that comes with the unit inside, separated by more cardboard, and fitting snugly. This is easily one of the best packaged radios on the market and, for the price, that fact is surprising. Most of them come inside of those awful bubble packs that have a bad habit of leaving your fingers cut up by the time you finally finish getting it open. This unit is a great distance from that, and is very professionally put together. Here is where you might encounter the first problem. The battery case is horrible. There is a little button you have to push to get it off. Unfortunately, the button is press into the opposite direction of the way you have to pull the case off. So you will be pushing it in and, thus, actually pushing the case harder into the unit. There is no easy way to get it off, other than simply messing with the frustrating mechanism for a few minutes. This point is hard to explain through text, but rest assured, it will be a problem. Not a problem that can’t be overcome somewhat easily, however. The range of the unit is much less than ten miles. It is closer to the one or two miles that most radios get. That’s industry standard, pretty much, but it is annoying that the advertising (as usual) gives an unrealistic impression of what you will actually be able to pull out of the final product. If you are going to be working in buildings or through the woods, the range might be even shorter. Keep this in mind if you plan to use it. Most of the functions on the unit can be figured out pretty easily even if you don’t read the manual. One that couldn’t be figured out, at least easily, is the backlight for the digital display. Marketing materials show a bright orange backlit display. That, at least with normal use, does not exist. None of the buttons seem to cut it on and there is no mention in the documentation of that functionality at all, leaving the user to believe that they will just have to run with whatever light there already is available. The radio comes through with enough clarity to make it worth using. All of the buttons are easy to push and do not present much trouble for the user. Again, though some things are problems on this radio, the overall unit is very good. Especially good at the price that they have it listed at. Even the belt clips that are included with the radios are very sturdy. Unfortunately, the same cannot be said for the battery case or the antenna, both of which seem like they are weak points that are holding the unit back from being truly great at the price point. A complaint can be made about the fact that this unit does not come with a charging cradle as well. Instead, it comes with either three single AC adapters or it comes with two of them, one of which is split down the middle in a Y shape. That leaves you having to plug in two or three AC adapters when you should only have to plug a single one in. It also means, as if it wasn’t already clear, that you cannot set this unit down right side up on a flat surface or anything when you are charging (though you can’t really do it any other time either). This method of charging is annoying. It leaves you with more counter space, yes, but it also leaves you with extra cords lying all over the place, extra accessories to keep track of, and with two less power outlets than you would otherwise have. Not a great design choice. One interesting thing to note is that this unit would be pretty great for kids. It has the right size and the right feel. It is easy to use and the buttons are bright enough to where it wouldn’t be lost very easily. With a lower price point, you don’t have to worry about them dropping and breaking the unit. The fact that you can get three at a time is another bonus. With that being said, it does need to be pointed out that some of the construction on this unit might not be able to hold up that well to strenuous use. Particularly the antenna on the unit and the battery case. Both of those feel like they would break pretty easily. If you are in the market for two way radios or you are shopping around for a cool camping gadget for your next trip, this might be a good choice for you. This is especially true if you are going to either have three members in your party or you plan to split up into more than two groups, because this unit comes with three radios instead of two like most packages come with. The packaging itself is also great. Compared with the cheap bubble packs that a lot of two way radios come in, the MD200TPR two way radio comes in a very nice box and everything is packaged inside snugly to prevent damage. All you have to do is cut a little sticker and open the box and you are good to go.Definitely a step up. While this radio does have a few issues, it is hard to beat the price. For about $55, you can snag three radios in a single package and be on your way to a great camping trip with some friends. Even so, you should weigh, carefully, whether the issues that the unit has will play a role in your particular situation. If you need a very long range unit or you believe that you will have a hard time seeing the small screen, you might want to opt for something else. In addition, the lack of loose battery capability and the fact that it doesn’t come with a dedicated charging cable (using three AC adapters instead), is extremely frustrating. Great unit, however, despite the flaws. Definitely worth a look.